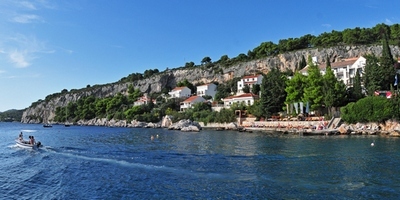 Hvar is the fourth largest island at 182 square miles (300 square km). It is even sunnier than Brac, with almost 2,800 hours of sunshine per year. However, there is enough rain to keep the island green and to maintain the beautiful fields of lavender, rosemary, sage, marjoram and thyme and the carefully cultivated vineyards. Many people remark that in the spring, Hvar smells like a herbalist shop! When in Hvar, you must purchase some lavender oil, which is the major export of the island.Split has a variety of restaurants and wine cellars, offering domestic specialities. There are many beaches and public beaches in the city and its surroundings, the most popular of them being Bacvice, a sand beach almost in the very heart of the town. Perched on the promenade, facing the old city center, the view from Adriana combines the Cathedral, the Arsenal, the Venetian piazza, the yacht harbor and the bay all in one soft sweep of the eyes. Completely renovated and reconceptualized as a stylish luxury hotel and spa, Adriana's amenities are as diverse as its view—making it a perfect place for you to relax, renew, and rejoice. The hotel is located about 100 meters from the town square. Hotel Adriana is first and only member of the Leading Small Hotels of the World. Tucked into a tranquil bay, surrounded by a lush pine grove, and only a short ten-minute walk from the historic city of Hvar, Amfora, member of the Special Hotels of the World, is the most exciting new resort in the Adriatic. Located 2 minutes away from the internationally renowned exclusive beach club Bonj ‘les bains’, Amfora really has it all. Set in a beautiful stone house, Apartments Olive Tree is located at a 2-minute-walking distance from the city centre of Hvar. It features a spacious and sunny terrace and air-conditioned accommodation. All rooms and apartments have a balcony overlooking the city centre and the surrounding lush greenery. Each accommodation is nicely furnished and has wooden floors and tea and coffee making facilities. Free access to Wi-Fi is provided as well. Guests can relax in the furnished garden or explore Hvar. The harbour and the Fortress Spanjola can be reached within a short walk. Amfora beaches are a 10-minute walk away. 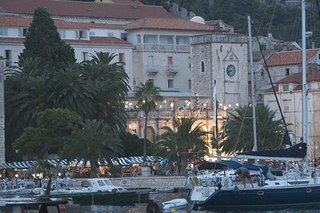 The city of Hvar is a unique fusion of luxurious Mediterranean nature, rich cultural and historical heritage, and a busy, touristy present. Hotel PODSTINE is situated only fifteen minutes away on foot from the main city square. Podstine is a peaceful and family-friendly place, a picturesque resort with one of the best spas in Europe, it has an excellent restaurant, a terrace and café bar overlooking the sea… It is homely, relaxingly elegant and non-pretentious. The hotel is situated in an arboretum with cypresses, palms and hundred years old pine trees and has a private beach, where the sea shows its crystal clarity. 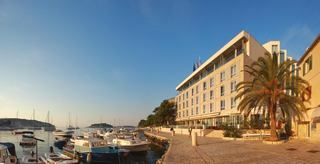 Hotel Riva, Hvar Yacht Harbour hotel, member of Small Luxury Hotels of the world, is located on Hvar waterfront in the town center, Hvar's most popular promenade. Hotel view gives a unique opportunity to watch romantic sunsets over the Paklinski islands through numerous yachts anchored in the port of Hvar. One part of the hotel building is more then 100 years old. In 2006 the hotel was completely reconstructed to meet the needs of modern traveler. 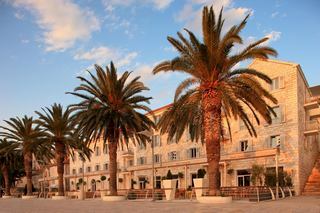 As the oldest hotel in Hvar, The Palace, hvar is a grand dame framed by gothic and renaissance architecture. History lovers will particularly enjoy its central location, which provides romantic views of the ancient piazza and neighboring buildings such as St. Stephen’s Cathedral, as well as glorious sunsets over the bay. The hotel itself, built at the turn of the twentieth century, has graciously aged charm and character that mirrors that of the island itself. Guests can dine to the snap and strum of live ensembles on San Marco terrace overlooking the yacht harbour. 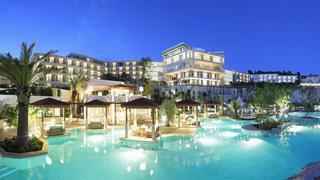 From the Adriatic ambiance to the ancient architecture on down to the live bands, everything at The Palace is classic. For the summer season of 2008, The Palace's exterior was preserved and its interior refurbished.